Can Lord Myners save the Co-op? Former M&S chairman Lord Myners will lead an inquiry into corporate governance at the Co-op. As sure as the sun rises in the east, as sure as night follows day, once ex Co-op Bank chairman Paul Flowers' penchant for all things powdered was uncovered, an inquiry into the Co-op Group's governance became a certainty. And lo, just days after the revelations, George Osborne ordered one. The only question was, who was going to chair it? This morning we got our answer: Lord Myners, the Laurel to Flowers' Hardy, the 'I' to his Uncle Monty, will join the group's board to lead a review into how it is run (and will be paid the princely sum of £1 for his troubles - how about a few Co-op savings stamps to sweeten the deal?). Co-op chairman Ursula Lidbetter, who was parachuted into her role after Len Wardle resigned (Wardled off into the sunset?) last month said the appointment of Myners, a former M&S chairman who spent two years at the Teasury, 'marks a significant strengthening of our ranks' - which, if tales of what goes on in the Co-op boardroom are to be believed, is an understatement. The problem is that the very values which originally differentiated the Co-op and cemented its status as an 'ethical' business are the ones under the spotlight. 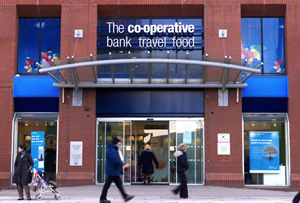 The Co-op's board is made up of 19 members, 14 of whom are elected and five of whom (including Lidbetter) are the heads of large regional co-operatives. Which is fine when those elected to the board are there for the right reasons - but David Cameron isn't the only one who wants to know how Flowers, who has no background in banking, got himself in. Myners is a Labour peer but that doesn't mean he'll be soft on the Co-op. He is notoriously fierce where banks are concerned - yesterday he told Sky News that the record £28m fine given to Lloyds was 'not enough'. Presumably various factions of government - not to mention the Co-op itself - are hoping Myners' 'tough love' approach will help restore the group's tattered reputation. Whether that's true remains to be seen - but the general sentiment among insiders seems to be that if anyone can do it, Myners can.